2. I saw three ships come sailing in, &c.
3. I asked them what they had in, &c.
4. They said they had the Saviour in, &c.
5. I asked them Where they found Him, &c.
6. They said they found Him in Bethlehem, &c.
7. Now all the bells on earth shall ring, &c.
8. 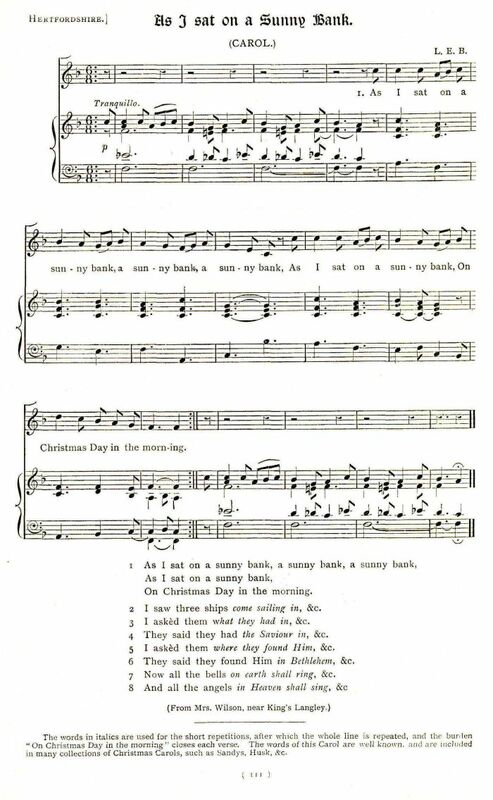 And all the angels in Heaven shall sing, &c.
The words in italics are used for the short repetitions, after which the whole line is repeated, and the burden 'On Christmas Day in the morning" closes each verse. The words of this carol are well known, and are included in many collections of Christmas Carols, such as Sandys, Husk, &c.